The Cold Steel OSS just showed up at BladeOps. This fantastic dual edged sub hilt fighter knife is built for heavy action. What is a sub hilt knife? It is a knife that features an extra guard below the normal handle guard. This extra guard is typically curved in the opposite direction as the normal handle guard–creating an extra secure space for your forefinger. This allows you to get and keep an ultra secure grip on your knife. The OSS features a hollow ground, ultra sharp blade that gives you the tool you need in the field. Whether you are out on a hunting expedition, serving your country, or just enjoying the outdoors, the Cold Steel OSS is the companion you want and need with you. 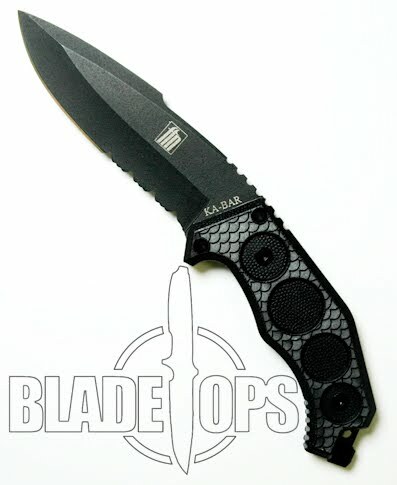 Just in, the new Cold Steel Marauder fixed blade knife. This battle ready combat knife got inspiration from the formidable combat knives or World War II. Merrill’s Marauders worked deep penetration missions during WWII in the China-Burma-India region. This knife is named in honor of Merrill and his men. This bowie style knife features a huge blade that is extra broad. The Japanese AUS8A blade can handle chopping, slashing, cutting, piercing, slicing, shearing, and pretty much anything else you ask it to do. It is built for heavy duty use. The full tang blade is encased in a double quillion sub hilt Kray Ex handle that can handle any type of weather conditions. Plus it is comfortable in your hand. Check out this new Cold Steel knife and see why it is taking the market by storm. The Cold Steel SRK, which stands for Survival Rescue Knife, is part of the Cold Steel Battle Ready Classics Series. This knife performs well in hand to hand combat, and now with the San Mai III steel it is even tougher. San Mai III has proven to be unsurpassed in strength, sharpness as well as ease re-sharpening. The blade is 3/16″ thick, and the handle is deeply checkered Kray-Ex. This knife is standard issue for Navy SEALS attending basic underwater demolition training (BUDS). 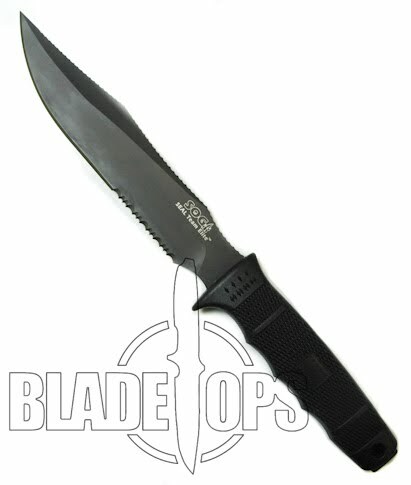 This is a tough, combat ready fixed blade knife that will serve you well for whatever mission you have. 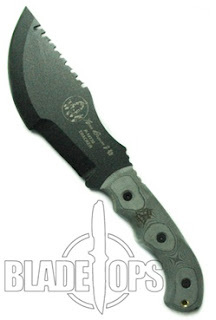 The TOPS Knives Tom Brown Tracker Fixed Blade Knife is a very large combat knife. Built with a curved a drop point blade, this middle of the blade has an interesting modification that gives you a big strectch of straight edgte that can be used for a multitude of purposes. The extra thick spine on the blade also sports a saw. This isn’t a wimpy little saw that you see on lots of “survival knives”. This is a heavy duty saw section with offset teeth for more aggresive cutting. If you are looking for a big, beefy survival knife that can do just about anything, the Tracker is just what you are looking for. Every once in a while, a knife comes along that really wows you. The Emerson Commander has been out for a couple of years now. But it is definitely one of those knives. Originally, it won the “Best Overall Knife of the Year” at the International Blade Show in Atlanta. And if you have ever held the Commander, you quickly can see why. The knife is reasonably big. It is rugged. And it is built strong. Made with a 154CM stainless steel blade with an excellent V grind, the Emerson Commander works like a charm. It is easy to open. You can even use the WAVE feature and open it as you pull it out of your pocket. The G10 scales make it easy to grip and hold onto. It is easy to see why so many elite forces around the world like the Commander knife. Strong, built to last and to perform, and easy to use. The Emerson Commander is a definite must have knife. Cold Steel makes some of the most durable and tough fixed blade knives on the market. 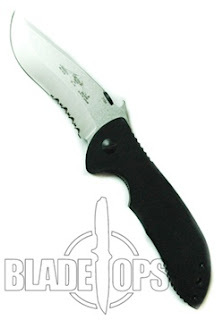 Recently, we started carrying one of their smaller fixed blade knives. The Kobun is a tanto style boot knife named after the Japanese word for “soldier”. The Kobun measures in at 9 7/8″ and the blade is 5 1/2. Made of Japanese AUS 8A stainless steel, the blade not only looks great but it performs amazingly well. This is a great knife for a wide variety of purposes. It has a very comfortable grip and is incredibly light at only 4.4 ounces. If you are looking for a boot knife, a combat knife, or just a great new knife to add to your collection, the Cold Steel Kobun would be a great fixed blade knife for you.